Fights the oxidative stress responsible for aging and the development of cancer. Plays a key role in the synthesis and metabolism of thyroid hormones. L-selenomethionine is a single chemical entity containing molecularly integrated selenium instead of sulphur in the methionine molecule - methionine being an essential amino acid. It is therefore a particularly safe form of selenium supplementation because, unlike other forms, it does not release inorganic selenium into the body. ¤ Plants absorb selenium from the soil and convert it into organic forms. Selenium is therefore found as selenomethionine in wheat and other cereals and is thus also the main type of selenium present in foods. When ingested in this form, it replaces the sulphur in proteins, both in animals and humans. Selenomethionine is also the main form in which the body stores selenium. It is directly incorporated into proteins via metabolic pathways similar to those used by methionine. It is converted into selenocysteine, and then incorporated into selenoproteins. ¤ The replacement of methionine by selenomethionine in the protein structure does not induce any functional changes. In fact, selenium in the protein structure protects DNA from oxidation more effectively than the sulphur in methionine. ¤ During photochemical reactions, the carbon-selenium bond is more easily broken compared to the carbon-sulphur bond. L-seleno-methionine preferentially accepts' the energy from light and provides greater protection to the skin against UV damage. ¤ The form of selenomethionine that the body is able to use is L-selenomethionine. It is absorbed and incorporated into the body's components better than any other form of selenium. 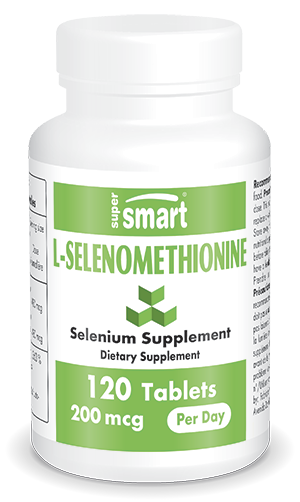 Its superior bioavailability has been demonstrated in several studies: selenium levels in red blood cells of individuals receiving selenomethionine increased by 100% after 16 weeks' supplementation. Neither selenate nor selenite supplementation produced such an increase. ¤ Led by the US National Cancer Institute, the Selenium and Vitamin E Cancer Prevention Trial is an ongoing study using L-selenomethionine. Launched in 2001, the 12-year study involves 35,000 men in the US, Canada and Puerto Rico and is investigating how selenium and vitamin E may protect against prostate cancer. Other ingredients: microcrystalline cellulose, magnesium stearate (E572), silicon dioxide (E551), fructo-oligosaccharides. In this form - the most abundant in food – selenium is rapidly and completely absorbed by the gastro-intestinal system.